Processed foods, additives and chemicals are inferior to real food and are potentially harmful to your health. So why do you still eat it? Why do you still eat that packaged granola bar and snack on those whole grain crackers? You may think that heart healthy label means something, but it doesn’t hold a candle to real food. Here’s an easy way to tell if your food is real or not: If your food can go bad, it’s good for you. If your food can’t go bad, it’s bad for you. Real food is fresh and unprocessed. This real food challenge has the potential to change your body forever. Take the next 7 days to ONLY eat real food. One week is a very short time in the grand scheme of things, and I know you can do this. Just try it for one week to see and feel the difference in your body. Breakfast:Breakfast is the most important meal of the day. What you decide to eat when you first wake up will set the tone for the rest of your meals that day. Scrambled organic eggs, sliced tomato and a handful of seasonal berries. Half of a dressed avocado and a few slices of nitrate-free bacon. Pancakes made with coconut flour and topped with chopped nuts. Lunch: Plan your lunch ahead of time in order to avoid turning to a fast food joint or vending machine. Pack your lunch the night before and carry it with you. Dinner: Dinner is the meal where most people splurge and eat far more calories than they should. Eating at home is the first step in reducing your dinnertime calories. Grilled white fish, sautéed spinach and almond bread. Baked chicken breast with steamed broccoli and quinoa. A big bowl of arugula topped with sautéed asparagus and sliced hardboiled eggs. While healthy eating is a huge factor in achieving your ideal weight, exercise is the other (very important) half of the equation. Your exercise routine should be challenging and should be done on a regular basis. Call or email me today and we will get you started on the exercise program that will reshape your body in 2013. In a small bowl whisk the olive oil, orange juice, orange zest, stevia, Dijon, salt and pepper. 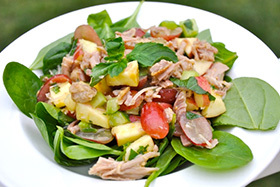 In a medium bowl combine the turkey, apple, celery, mint and grapes. Toss with the dressing. Prepare each plate with a pile of spinach. Top with the turkey salad mixture. What are you going to do differently in 2013? Are you going to reduce your stress level? Are you going to improve your diet? Are you going to take exercise more seriously? Or will you allow the next 365 days to pass by without changing a thing? If you haven’t put any thought into it, then do so now. The fact is that you will age and change in 2013, and next year on 12-31-13 you will be slightly (or dramatically) different than you are today. The cool thing about a New Year is that it gives us the opportunity to reflect over our life, to acknowledge where we are and where we want to be headed. 1) Exercise 2 more hours each week than you did in 2012. 2) Go to bed and wake up at the same time each day. 4) Sign up for one of my time-tested fitness programs. 5) Stop drinking and eating artificial sweeteners. 7) Eat less bread, or even eliminate gluten from your diet. 8) Train for a 5K, 10K or a marathon. 9) Eliminate corn syrup from your diet. 10) Exercise at least 4 times each week. 11) Eat healthy, simple dinners at home. 12) Do not eat fast food. 14) Eat more protein and fiber. 15) Drink water throughout your whole day. 16) Do not eat packaged snack foods. 17) Contact me for motivation and support. Now come up with a few of your own. I know there are some ideas that popped into your mind while you were reading my list. Take a minute to jot those down. Step back and re-examine the list. Which of these changes are you going to make your own? I certainly don’t expect you to make all of these changes – though the more you do, the greater your transformation will be. Remember, like I mentioned above in #4 and #17, I’m here to offer you the instruction, support and motivation you need to make 2013 the year of your dramatic transformation. Wishing you great health and happiness this year. Healthy Fast Food: Fact or Fiction? Sounds too good to be true, right? Fast food that is healthy? Fast food has a reputation for being high in trans fat, saturated fat, sodium, and calories, while having next to no healthy ingredients. For example, one loaded hamburger, fries, and pie contain more saturated fat than you should eat in two days. However, things are changing. The past few years have seen many fast-food restaurants make a concerted effort to improve their menus. As a result, many restaurants now offer low-fat options and fresh ingredients. Choose wisely and you no longer have to sacrifice a healthy meal for the sake of convenience. But to do this, you must be an informed customer, resist menu temptations, and make healthy choices when it comes to fast food. Finding a nutritious, cheap, convenient meal may be a challenge, but it can be done. …of menu lingo. Steer clear of meals labeled fried, breaded, basted, creamy, crispy, batter-dipped, au gratin, scalloped, or Alfredo. These dishes are usually high in unhealthy fats, sodium, and calories. Instead, go for lean meat options that are broiled or grilled and fresh or steamed veggies. If needed, special order your food to be prepared in a healthier manner. …of extras. A salad may seem like a low-fat option until you drown it in fried toppings, high-fat dressing, and cheese. A deli sandwich is a great choice until you add the mayo, spreads, and cheeses. The same goes for a baked potato. What about the butter, cheese, bacon, salt, and mountain of sour cream? Simple, fresh ingredients are best. Ask for dressings and toppings on the side so you can monitor how much is added. …of portion sizes. A single serving at many restaurants could feed an entire family. The average meal at a fast-food joint can contain more than 1,000 calories. Extra large options should be replaced with smaller portions or shared with family or friends. Don’t forget the calories contained in your drinks. Often overlooked, the calories in sodas and sweetened beverages add up quickly. Try unsweetened iced tea or lemon water instead. …of buffets! Even if you choose the salad bar, buffets set the stage for overeating. You may just want to eat your money’s worth, but chances are, you’ll eat more than you need. After finishing your meal, wait at least 20 minutes before heading back for seconds. Your body needs time to tell your brain your stomach is full. …of eating on the run. Isn’t this what fast food is all about? Unfortunately, when you’re in a hurry and aren’t thinking about what you’re eating, you tend to overeat and overindulge. Slow down and chew slowly. Your food will digest easier and you’ll most likely eat less. Remember, it takes time for your brain to get the message that you’re satisfied. So chew well and give your brain the chance it needs. Knowing is half the battle. The other half is making the right choices. Depending on your health condition, it may be OK to splurge every once it a while, but a habit of double-patty, greasy burgers and large fries every week will hurt your body. While there are healthier options available these days at fast-food joints, nothing is as fresh and nutritious as a home-cooked, low-fat meal. Save the fast-food meals for rare occasions when there’s no better option.